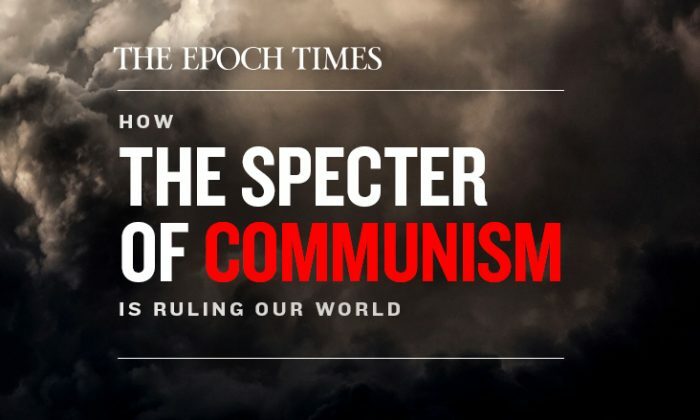 The Epoch Times is serializing a translation from the Chinese of a new book, How the Specter of Communism Is Ruling Our World, by the editorial team of the Nine Commentaries on the Communist Party. NOTE: This chapter was updated with content edits and end notes at 10:18 p.m. on March 5, 2019. Chang Ping, former news director of the major Chinese newspaper Southern Weekend, said that since 2009, the Chinese regime allocated 45 billion yuan (US$6.52 billion) to the “national strategy for external propaganda in public relations and publicity.” According to Chinese media sources, the 45 billion yuan was only a small part of the total expenditure that had been publicized. BBC estimated in 2016 that the CCP spends $10 billion (US$1.45 billion) a year on propaganda. In March 2018, the CCP integrated CCTV, CRI, and China National Radio to establish the China Media Group, also called Voice of China, led by the Propaganda Department of the Central Committee of the Communist Party of China. It has become the largest propaganda machine in the world. According to incomplete statistics, as of the end of 2017, the CCP had established 525 Confucius Institutes (targeting colleges and universities) in 146 countries and opened 1,113 Confucius Classrooms (targeting elementary and secondary schools). The Confucius Institute’s funds come from Hanban, which is affiliated with the CCP’s United Front Work Department (UFWD). The use of funds is supervised by personnel from the CCP’s embassies and consulates. Confucius Institutes subvert important academic principles of autonomy and freedom of inquiry, aim to promote the CCP’s version of events, distort the history of China, and omit the CCP’s appalling human rights record. In some Confucius Institute classrooms, quotations of Mao Zedong are hung on the wall. On the surface, Confucius Institutes claim to teach Chinese culture, but in fact they promote communist doctrine and transmit Party culture. In order to advance its goal of ultimately dominating the world, the CCP adopts any means necessary. This is a key part of the “united front” concept. Mao labeled the united front as one of the CCP’s “three magic treasures.” The civil war-era Kuomintang government was deceived by these tactics and suffered great losses as a result. Today’s Western governments have also been deceived and suffered losses. The good news is that Western society is beginning to wake up, and a number of investigative reports about the united front have recently been published. Hollywood covets China’s rapidly growing movie market, and executives are well-aware that they’ll be excluded from it if they fail to toe the Party line. Thus, they set about ensuring they are in compliance with Chinese censorship. American movie stars who’ve taken a stand on the CCP are blocked from entering the country, or their films are excluded from the Chinese market. Hollywood star Richard Gere’s clear expression of his position on Tibet, for instance, not only led to his being denied access to China, but also limited his own career even in the United States. In order not to offend or provoke the CCP, film producers have declined to invest in his films. Other movie stars have been blacklisted for other transgressions. The above report by the U.S. government is open for the public to see. The killer weapon that China uses to realize its technological leap forward is the blatant theft of Western technology. China’s aptitude for industrial espionage far exceeds the scope of commercial spies in the past. In order to steal technology and secrets from the West, the regime mobilizes all available personnel and tactics — including espionage, hackers, international students, visiting scholars, Chinese and Taiwanese immigrants working in Western companies, and Westerners lured by monetary interests. The National Institute of Health released a report on the Chinese talent programs on December 13, 2018, noting that foreign nationals transferred U.S. intellectual property to their native countries while on the U.S. government payroll. Their actions have unfairly impacted all U.S. academic institutions. M. Roy Wilson, one of the authors of the report and co-chair of the NIH Advisory Committee, said that a key qualification of becoming part of the Thousand Talents Program is having access to valuable intellectual property. He said that the problem was significant, not random, and that the severity of the intellectual property losses was impossible to ignore. The CCP has also used legislation to force all Chinese people into participating in its unrestricted warfare. The National Intelligence Law of the People’s Republic of China, passed by the Standing Committee of the National People’s Congress, clearly states that “national intelligence agencies may require relevant agencies, organizations, and citizens to provide necessary support, assistance and cooperation.” This means that any Chinese citizen can be coerced by the CCP to collect intelligence and become a spy. This form of intelligence collection has never been seen before. The CCP’s typical diplomatic method is to divide and conquer. When the world criticizes the CCP for its human rights abuses, the CCP invites each country to discuss human rights separately. While many countries have discussed human rights issues with the CCP in private, doing so has no restraining effect on the Party. It simply delays and argues with the various countries individually, but never makes any substantial changes. Moreover, it has virtually disintegrated the international norms that safeguard human rights. The CCP used this method to escape condemnations and sanctions, and then immediately joined the World Trade Organization (WTO). Right away, it started to use economic means to tempt various countries, and then again used divide-and-conquer to achieve large-scale breakthroughs in various areas. The CCP has developed asymmetric weapons, such as anti-ship missiles and anti-aircraft carrier missiles. In terms of conventional weapons, the CCP has attempted to surpass the technological supremacy of the United States by having a larger quantity of matériel targeting those prize assets. The CCP has grown economically and technically, giving it greater operational space to implement cyberwarfare, outer-space warfare, and other unconventional high-tech attack vectors against the United States, as addressed in the last section. The CCP’s nature means that it will always set itself against traditional culture, orthodox morality, and universal values. Today’s CCP is the world’s axis of evil and the enemy of mankind. If the world cannot wake up and take action against the regime, the failure will bring disaster to the world for the following reasons. 5. Louisa Lim and Julia Bergin, “Inside China’s Audacious Global Propaganda Campaign,” The Guardian, December 7, 2018, https://www.theguardian.com/news/2018/dec/07/china-plan-for-global-media-dominance-propaganda-xi-jinping. 9. “Chinese President Xi Jinping Visits With CCTV America via Video Call,” CGTN, February 19, 2016, https://america.cgtn.com/2016/02/19/chinese-president-xi-jinping-visits-with-cctv-america-via-video-call. 11. Koh Gui Qing and John Shiffman, “Beijing’s Covert Radio Network Airs China-Friendly News Across Washington, and the World,” Reuters, November 2, 2015, https://www.reuters.com/investigates/special-report/china-radio/. 12. Louisa Lim and Julia Bergin, “Inside China’s Audacious Global Propaganda Campaign,” The Guardian, December 7, 2018, https://www.theguardian.com/news/2018/dec/07/china-plan-for-global-media-dominance-propaganda-xi-jinping. 13. James Fallows, “Official Chinese Propaganda: Now Online from the WaPo!” The Atlantic, February 3, 2011, https://www.theatlantic.com/international/archive/2011/02/official-chinese-propaganda-now-online-from-the-wapo/70690/. 14. Donnelle Eller, “Chinese-Backed Newspaper Insert Tries to Undermine Iowa Farm Support for Trump, Trade War,” Des Moines Register, September 24, 2018, https://www.desmoinesregister.com/story/money/agriculture/2018/09/24/china-daily-watch-advertisement-tries-sway-iowa-farm-support-trump-trade-war-tariffs/1412954002/. 15. Bethany Allen-Ebrahimian, “Beijing Builds Its Influence in the American Media,” Foreign Policy, December 21, 2017, https://foreignpolicy.com/2017/12/21/one-of-americas-biggest-chinese-language-newspapers-toes-beijings-party-line-china-influence-united-front/. 17. Jeffrey Gil, “Why the NSW Government Is Reviewing Its Confucius Classrooms Program,” The Conversation, May 17, 2018, http://theconversation.com/why-the-nsw-government-is-reviewing-its-confucius-classrooms-program-96783. 18. Alexander Bowe, China’s Overseas United Front Work: Background and Implications for the United States, U.S.-China Economic and Security Review Commission, August 24, 2018, 5–6， https://www.uscc.gov/sites/default/files/Research/China%27s%20Overseas%20United%20Front%20Work%20-%20Background%20and%20Implications%20for%20US_final_0.pdf, 14. 19. John S. McCain National Defense Authorization Act for Fiscal Year 2019, House of Representatives, https://docs.house.gov/billsthisweek/20180723/CRPT-115hrpt863.pdf. 20. Bowe, China’s Overseas United Front Work: Background and Implications for the United States, 5–6. 21. Thorsten Benner et al., “Authoritarian Advance: Responding to China’s Growing Political Influence in Europe,” Global Public Policy Institute (GPPI), https://www.gppi.net/media/Benner_MERICS_2018_Authoritarian_Advance.pdf. 22. Chinese Influence & American Interests: Promoting Constructive Vigilance (Stanford， California: Hoover Institution Press, 2018), https://www.hoover.org/sites/default/files/research/docs/chineseinfluence_americaninterests_fullreport_web.pdf. 23. Jenni Marsh, “Ex-Hong Kong Politician Faces Jail after Bribery Conviction in US,” CNN, December 5, 2018, https://www.cnn.com/2018/12/05/asia/patrick-ho-bribery-conviction-intl/index.html. 24. Alexandra Stevenson, David Barboza, Matthew Goldstein and Paul Mozur, “A Chinese Tycoon Sought Power and Influence. Washington Responded,” The New York Times, December 12, 2018, https://www.nytimes.com/2018/12/12/business/cefc-biden-china-washington-ye-jianming.html. 26. Chinese Influence & American Interests: Promoting Constructive Vigilance (Stanford， California: Hoover Institution Press, 2018), https://www.hoover.org/sites/default/files/research/docs/chineseinfluence_americaninterests_fullreport_web.pdf. 27. Isaac Stone Fish, “Huawei’s Surprising Ties to the Brookings Institution,” The Washington Post, December 7, 2018, https://www.washingtonpost.com/opinions/2018/12/08/chinese-companys-surprising-ties-brookings-institution/?utm_term=.2720ba57db52. 29. Zack Dorfman, “How Silicon Valley Became a Den of Spies,” Politico, July 27, 2018, https://www.politico.com/magazine/story/2018/07/27/silicon-valley-spies-china-russia-219071. 30. Bowe, China’s Overseas United Front Work: Background and Implications for the United States, 11–12. 31. Bowe, China’s Overseas United Front Work: Background and Implications for the United States, 10–12. 34. Amy Qin and Audrey Carlsen, “How China Is Rewriting Its Own Script,” The New York Times, November 18, 2018, https://www.nytimes.com/interactive/2018/11/18/world/asia/china-movies.html. 35. Ben Fritz and John Horn, “Reel China: Hollywood Tries to Stay on China’s Good Side,” The Los Angeles Times, March 16, 2011, http://articles.latimes.com/2011/mar/16/entertainment/la-et-china-red-dawn-20110316. 39. Bowe, China’s Overseas United Front Work: Background and Implications for the United States, 7–8. 41. Sankei Shimbun, “Japan’s Transfer of Bullet Train Technology a Mistake. China, of Course, Has Copied It,” Japan Forward, August 18, 2017, https://japan-forward.com/japans-transfer-of-bullet-train-technology-a-mistake-china-of-course-has-copied-it/. 42. Paul Mozur and Jane Perlez, “China Bets on Sensitive U.S. Start-Ups, Worrying the Pentagon,” The New York Times, March 22, 2017, https://www.nytimes.com/2017/03/22/technology/china-defense-start-ups.html (last visited February 2, 2019). 44. Office of the United States Trade Representative, Executive Office of the President, Update Concerning China’s Acts, Policies and Practices Related to Technology Transfer, Intellectual Property, and Innovation, November 20, 2018, https://ustr.gov/sites/default/files/enforcement/301Investigations/301%20Report%20Update.pdf, 46. 45. Justin Ling, “Man Who Sold F-35 Secrets to China Pleads Guilty,” Vice News, March 24, 2016, https://news.vice.com/en_us/article/kz9xgn/man-who-sold-f-35-secrets-to-china-pleads-guilty. 46. Cynthia McFadden, Aliza Nadi and Courtney McGee, “Education or Espionage? A Chinese Student Takes His Homework Home to China,” NBC News, July 24, 2018, https://www.nbcnews.com/news/china/education-or-espionage-chinese-student-takes-his-homework-home-china-n893881. 47. “Chinese Hackers Indicted,” FBI News, December 20, 2018, https://www.fbi.gov/news/stories/chinese-hackers-indicted-122018. 48. Zach Dorfman, “How Silicon Valley Became a Den of Spies,” Politico, July 27, 2018, https://www.politico.com/magazine/story/2018/07/27/silicon-valley-spies-china-russia-219071. 50. Lawrence A. Tabak and M. Roy Wilson, “Foreign Influences on Research Integrity,” Presentation at the 117th Meeting of the Advisory Committee to the Director, NIH, December 13, 2018, https://acd.od.nih.gov/documents/presentations/12132018ForeignInfluences.pdf. 51. Lev Facher, “NIH Report Scrutinizes Role of China in Theft of U.S. Scientific Research,” STAT, December 13, 2018, https://www.statnews.com/2018/12/13/nih-report-scrutinizes-role-of-china-in-theft-of-u-s-scientific-research/. 52. Jennifer Zeng, “Communist China Poses Greatest Threat to US and World, Senators Told,” The Epoch Times, updated December 17, 2018, https://www.theepochtimes.com/senate-told-communist-china-poses-greatest-threat-to-us-and-the-world_2738798.html. 53. Keith Bradsher, “When Solar Panels Became Job Killers,” The New York Times, April 8, 2017, https://www.nytimes.com/2017/04/08/business/china-trade-solar-panels.html?_ga=2.209817942.255138535.1542571491-142437734.1525387950. 55. Statement of John C. Demers Before the Committee on the Judiciary, United States Senate, for a Hearing on China’s Non-Traditional Espionage Against the United States: The Threat and Potential Policy Responses, U.S. Senate, December 12, 2018, https://www.judiciary.senate.gov/imo/media/doc/12-12-18%20Demers%20Testimony.pdf. 56. Megan Henney, “US Leaders React to Huawei CFO Arrest: ‘A Threat to Our National Security,’” Fox Business, December 6, 2018, https://www.foxbusiness.com/markets/us-leaders-react-to-huawei-cfo-arrest-a-threat-to-our-national-security. 57. Danielle Cave, “The African Union Headquarters Hack and Australia’s 5G Network,” Australian Strategic Policy Institute, July 13, 2018, https://www.aspistrategist.org.au/the-african-union-headquarters-hack-and-australias-5g-network/. 60. “Peter Navarro on China’s National Security Risks to US,” Fox Business, December 13, 2018, https://video.foxbusiness.com/v/5979037938001/?#sp=show-clips. 62. Eri Sugiura, “China’s 5G a Bigger Threat than Trade War, Says Ex-Dallas Fed Chief,” Nikkei Asian Review, September 24, 2018, https://asia.nikkei.com/Economy/China-s-5G-a-bigger-threat-than-trade-war-says-ex-Dallas-Fed-chief. 63. Gregg Re, “Trump Declares Opioids From Mexico, China ‘Almost a Form of Warfare,’ Tells Sessions to Sue Drug Makers, Fox News, August 16, 2018, https://www.foxnews.com/politics/trump-declares-opioids-from-mexico-china-almost-a-form-of-warfare-tells-sessions-to-sue-drug-makers. 64. Kirsten D. Madison, “Stopping the Poison Pills: Combatting the Trafficking of Illegal Fentanyl from China,” Prepared Statement Before the Senate Caucus on International Narcotics Control,” U.S. Department of State, October 2, 2018, https://www.state.gov/j/inl/rls/rm/2018/286384.htm. 65. Markos Kounalakis, “China Is Using Fentanyl in a Chemical War Against America,” Mcclatchy D.C. Bureau, November 2, 2017, https://www.mcclatchydc.com/opinion/article182139386.html. 66. Anna Fifield, “China’s Row With Sweden Over a ‘Racist’ TV Skit Has Citizens Urging Boycotts of Ikea and H&M,” The Washington Post, September 26, 2018, https://www.washingtonpost.com/world/2018/09/26/chinas-row-with-sweden-over-racist-tv-skit-has-citizens-urging-boycott-ikea-hm/?noredirect=on&utm_term=.15e1b22bc530. 67. Xinmei Shen, “How China’s Army of Online Trolls Turned on Sweden,” Abacus News, September 26, 2018, https://www.abacusnews.com/digital-life/how-chinas-army-online-trolls-turned-sweden/article/2165747. 68. T. Casey Fleming, Eric L. Qualkenbush, and Anthony M. Chapa, “The Secret War Against the United States,” The Cyber Defense Review, Vol. 2, Number 3, Fall 2017, 25–32, https://cyberdefensereview.army.mil/Portals/6/Documents/CDR-FALL2017.pdf. 69. “How the West Got China Wrong,” The Economist, March 1, 2018, https://www.economist.com/leaders/2018/03/01/how-the-west-got-china-wrong. 70. Michael Pillsbury, The Hundred-Year Marathon: China’s Secret Strategy to Replace America as the Global Superpower (New York: St. Martin’s Press, 2015), the Introduction. 71. Steve Bannon, “Speech at the 12th Interethnic, Interfaith Leadership Conference,” November 15, 2017, https://www.youtube.com/watch?v=OMp8F2tL66I.